Four entries across DJR Team Penske, Triple Eight Race Engineering, and Team 18, have incurred fines and teams’ championship points penalties for various breaches during Race 9 at Phillip Island. While Scott McLaughlin and Fabian Coulthard will keep their one-two result, as expected, Shell V-Power Racing Team has been hit with a $3000 fine and 30-point penalty for each car. Triple Eight and Team 18 have each been slapped with $5000 fines and 30-point penalties after wheels departed Jamie Whincup’s Red Bull HRT ZB Commodore and Mark Winterbottom’s Irwin Tools ZB Commodore during the race. The DJRTP Mustangs disengaged their line lockers during each of McLaughlin’s and Coulthard’s pit stops due to unexpected engine shutdowns which team boss Ryan Story says the team has not encountered before. 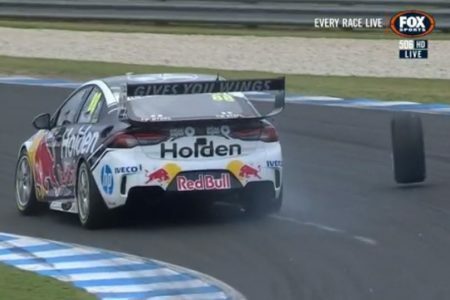 As such, they breached a new-for-2019 rule which was, ironically, introduced to stop wheel-spinning during pit stops after the controversial Shane van Gisbergen incident at Pukekohe last year. “Following admissions to the breaches by the Team, the Stewards imposed Penalties of Fines in the sum of $3,000 and the Loss of Thirty (30) 2019 Virgin Australia Supercars Teams Championship Points on Racing Team (Aust) Pty Ltd for each of two breaches of the Article 5.11.2 of the Event Supplementary Regulations, one in connection with Car #12, the other Car #17, during the Pit Stops for those Cars – brake lock mechanism not engaged at all times during Pit Stop before Car was returned to the ground,” read the stewards summary. Whincup’s drama was more easily explained, with his car being dropped before the right-front tyre changer had fully tensioned the wheel during his pit stop. The seven-time champion was quickly notified of the drama on his radio and despite trying to crawl back to pit lane, the wheel parted company at the Siberia left-hander. Winterbottom had already suffered a suspected right-rear tyre issue which hampered him until the pit window opened at the end of Lap 5, before the second wheel on that corner fell off on Lap 19. “Following admissions to the breaches by each Team, the Stewards imposed Penalties of a Fine of $5,000 and the Loss of Thirty (30) 2019 Virgin Australia Supercars Teams Championship Points on each of Triple Eight Race Engineering (Australia) Pty Ltd and Chasports Racing Pty Ltd for breaches of Rule A4.4.1 (Safety, Each Competitor is responsible for all safety aspects of the Team including that Competitor’s Car or Cars, Team members, equipment, Pit Garage and visitors to its Pit Garage at all times) after wheels from Car #88 and Car #18 were observed to have dislodged following Pit stops,” advised stewards regarding those entries. Winterbottom went on to finish 21st, the last car on the lead lap, while Whincup pulled off the road near The Hayshed and was a non-finisher. DJRTP’s teams’ championship lead is therefore reduced by only 30 given that Triple Eight remains second, now by 388 points.